Companies developing autonomous and connected vehicle technology face risk of losing critical startup time and money buying and modifying a vehicle to use to test their software. Vehicles must be drivable by wire and equipped with a technology stack that includes onboard cameras and sensors, as well as the processing power to manage the vast data generated by the vehicle. 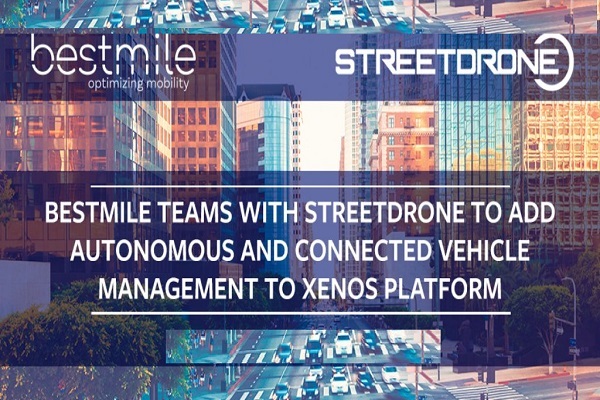 In this line, Bestmile is integrating its Mobility Services Platform into StreetDrone’s Xenos platform to offer a complete vehicle and mobility service operating system. StreetDrone, referring to itself as the “Android of the autonomous vehicle world,” offers an operating system on which others can build self-driving applications. The company’s Xenos platform provides a combination of hardware—including modified Renault Twizy vehicles—and software to form a foundation for integrating the technologies that need to work together for connected and autonomous vehicles to be safe and reliable. Bestmile Claims its Mobility Services Platform enables vehicles of any brand or type to communicate and work as intelligent fleets. Its technology enables human-driven and autonomous vehicles to work together to deliver on-demand services with optimized dispatching, routing, pooling, and energy and maintenance management. The platform also offers advanced matching algorithms that can process traveler, vehicle and third-party data to send the right vehicle to the right place at the right time. The partnership with Bestmile makes StreetDrone vehicles “fleet ready” for testing scalable fleet services in addition to testing individual vehicle performance.